Week to week, white Southern Baptists are busy defending African slavery and denigrating the United States for attempting to thwart God’s express will for the African race. Several items in this week’s Georgia Baptist Christian Index focus on this very theme. One article castigates Northern Baptists for their duplicity in such decidedly ungodly doings, by citing a letter from a Northern Baptist pastor to a Union soldier. From before the war began, white Southerners, including Baptists, have been accusing U.S. President Abraham Lincoln (whom they commonly refer to as the “Black President”) and northerners at large as determined to eradicate Southern slavery. While Lincoln and the Republican Party desire to do just that, and believe the ending of African slavery is key to winning to the war, the president has thus far proceeded slowly toward emancipation, realizing that a significant minority of Northerners are not advocates of freedom for persons of color, and not wanting to drive the Upper South states out of the Union. Southern Baptists, however, are certain of the righteousness of African slavery and of God’s alliance with the Confederacy. Adiel Sherwood, prominent Georgia Baptist pastor, offers a scriptural defense of slavery, while dismissing the liberal theology of Northern Baptists (and other Northern Christians) who attempt to exorcise slavery from the Bible. “The fanaticism of abolitionism” leads to such heretical, non-literal readings of scripture, Sherwood argues. ….But what harm is done by these perversions? These false teachings have had their influence in embroiling this land in fratricidal blood–of bringing on this horrid war. About forty-four years ago, some very sanctimonious persons whose fathers had become rich by the slave trade, began to groan over the guilt of slavery, repudiating all [connection] with the hated thing, and dis-fellowshipping all involved in the institution or sympathizing with it. 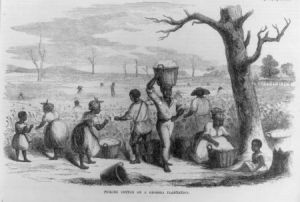 It has become a profession to inculcate hatred against the sinfulness of slavery in books, schools and families: more than two Presidential campaigns have been conducted on this plank in the platform: “No more slave territory;” and the South which did the most to acquire land from Mexico, was to be shut out from its enjoyment.–Others have taught the same erroneous interpretation, and the consequences are before us. Where men are so wedded to cherished theories, so prejudiced against obvious truth as to pervert the plain meaning of words; there is no safety in their interpretations. A literal Bible is the religious foundation of African slavery and white supremacy, the justification of the righteousness of slave owners. The Southern Baptist Convention was founded by a convening of slave owners in 1845, and Southern Baptist leaders now make certain that African slaves and common white folk don’t forget what is that the moral heart of the Confederacy.